One of the fashion worlds' muses has just released her first book on the subject, simply called "IT". Alexa Chung herself is often described by VOGUE and fellow magazines as an It-girl. 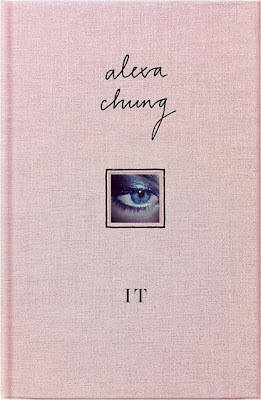 Alexa Chung´s not only working as a model, TV-hostess and contributing editor at VOGUE. She also had the famous Mulberry bag "Alexa" named after her. In this book Alexa Chung gives us her writings, doodles and photographs. It´s already a top ten bestseller on Amazon (although some of the press weren´t exactly overwhelmed). The author reflects on heartbreak, how to get dressed in the morning and how to take a perfect selfie (a must know for fashion bloggers) among other necessities. I haven´t read it yet, but it´s a beautiful cover perfect for a coffee table book. Looks really cool, great coffee table book!